What heater for Mic6 plate? I'm in the process of designing my new printer. I've decided I want to try a 1/4" or 3/8" Mic6 aluminum build plate, but wondered about the heater. I have a 300mm MK2a heat bed here that came with one of my printers. I was wondering if this was a suitable heater if I could somehow attach it properly to the bottom of the Mic6 plate. I'm not sure if this heater can be ran off of 24v or not, but I was more concerned with the size. If this style of heater is suitable, I think I can find a 24v easy enough if I go that route. Re: What heater for Mic6 plate? OK well I kind of talked myself out of using this heater that I have here, I will go with a Keenovo type of heater instead. I see where there are 30cmx30cm silicone pads available, so I guess I should order the Mic6 plate to be around 320mm. I think this will end up being in the 300w-400w range. I don't really want a 750w heater if it's not needed, I think I would rather downsize to a 25cm bed instead, but I think 300w-300w should do it. It would be nice to use a 24v 350w Meanwell supply if possible, though I haven ruled out a SSR. I just ordered a 330mm x 330mm (13" x13") x 9.5mm (0.375") Mic6 aluminum plate. Now I just have to decide if I want to go with a SSR and AC or 24V with a Meanwell PSU. I'm leaning towards the AC and SSR so that I don't have to buy the 24v PSU @500w. The slight concern is all of the already made ones I am finding are 750w for a 30cm x 30cm 120VAC. I see that they do have custom ones available, I'd have to educate myself on all the options to be sure to select one similar to the ones they already make for 3D printers. I'm not being lazy, just I'll still be sitting here days later if given too many choices lol. 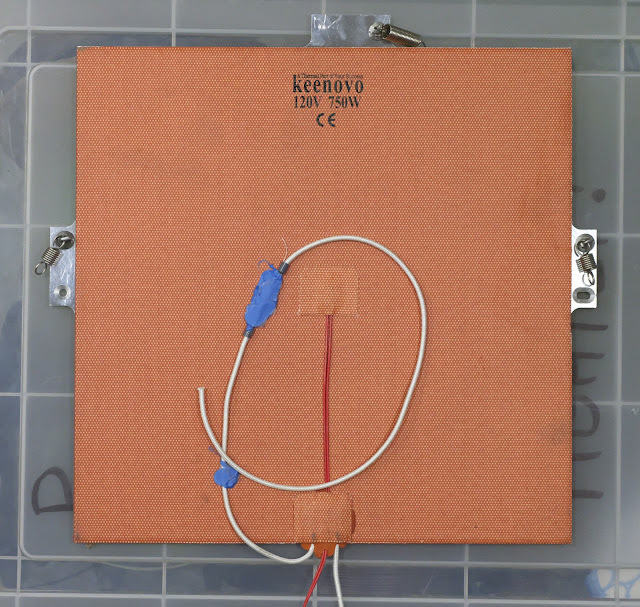 I ordered a 30cm x 30cm Keenovo 750w 120VAC heating element. Next I guess I will look for a SSR. The Fotek SSR-25DA seems to be used fairly often. I ordered the Crydom D2425 that was suggested in the Duet hardware page. It was considerably more money then the Fotek, on the other hand it's a pretty important part. This way I know it is not a counterfeit as I purchased it from a Crydom distributor. It seems quite a few of the 25A Fotek on Amazon etc. may actually contain internals that can only handle half the current. I've never seen anyone reply to their own posts so many times, so quickly! No one can ever say you lack enthusiasm! I use the same 750W heater on a 300x300x8mm plate and it gets to 100C for printing ABS in 4.5 minutes. I put my printer's bed design on a blog page including the kinematic mount and info on a thermal cutoff to protect against SSR failure. I mounted the TCO on the bed plate, but it won't do its job if the heater comes off the bed plate, so it is best to put the TCO on the heater itself using high temperature silicone. I have recently found that the adhesive on the heater is starting to let go of the plate in my printer after two years of use. At some point in the near future, I'll peel it completely off the plate and reglue it with high temperature silicone. Hi, great job updating your thread so fast. Can you give a link for the Mic6 plate? I am using the 750 watt keenovo pad with Cyrydom ssr too but my plate is only 1/8 thick. Well I wasn't sure how long it would be for a response lol. Thanks for the calculator link. It looks like with this setup I will get to PETG temperature (60C) in about 2.5 minutes. It would have been closer to 6 minutes with a 350watt heater. I guess I am OK with the 750watt now that it is ordered. In reality a 350watt may not be any safer then a 750watt, just depends on the failure mode I suppose. If I am confident I can attach a TCO to the silicone pad securely I will do that, if not I will put it on the plate. It looks like the Keenovo pad has some fiberglass weaved into it, hopefully this is enough to grab onto some silicone. I was wondering how long the glue would last, so your comment about the glue starting to let go is timely. I rarely go over 60C-65C on the bed so I could extrapolate that I should get at least the same amount of time. I was wondering if i packed some fiberglass insulation underneath the heater and on top of the support underneath, if this pressure would help keep the pad pushed up against the plate. Perhaps a regular inspection for bubbles is a more pragmatic approach, as I wouldn't want to miss the heater starting to bubble if the fiberglass didn't hold it up. I might have felt a little better if the heater was low enough wattage that it could run safely detached from the plate, although I don't know if that is the case. In realty I could always custom order a different one if compelled to do so. I will check out your blog, I'm sure I've come across your material in the past. It set me back $100 Canadian before shipping and tax. I just went with something within the province because we have a rolling postal strike going on, I might not have saved much getting it from the States by the time I factor in potential customs etc. Last night I did come across others who were getting ATP 5 plate from a place in the states for pretty cheap, I think it was Midwest metals and around $35 US plus shipping for 3/8". That might have been the prudent choice for myself, but as I say the delay with mail strike and customs, I decided to splurge a bit to have what I wanted in a reasonable amount of time. Edited 1 time(s). Last edit at 11/08/2018 07:39PM by Number_5. Thanks Number 5, I'm in Ontario so this good for me. Edited 1 time(s). Last edit at 11/08/2018 09:37PM by Number_5. I bought ATP-5 from Midwest, and it came with multiple dings and substantial swarf in the box, poorly wrapped even though I asked for extra cardboard wrapping in the comments in my order. I have since bought ALCA 5 from Howard Precision and it was less expensive, wrapped well, reasonably cleanly packed, and had no surface dings on multiple pieces. I kinda got the feeling that the pieces Midwest sold at that price may have been off-cuts or damaged pieces. Oh do they? I will have a look, thanks. EDIT: DO you have a link, I found one combined with a P.I.D. controller, but not on it's own. Edited 1 time(s). Last edit at 11/09/2018 10:26PM by Number_5. I found what is claimed to be a genuine 40 amp Fotek SSR. The reason I switched is because DigiKey could not fulfill the order on the Crydom SSR. Kind of annoying but I suppose this Fotek is less money and has more headroom anyway, assuming it is in fact genuine. Had a mic 6 1/4 thick plate for about a year now. Best investment so far for my delta. which just happen to come in 300x300 sizes from Micheals here in Canada(B.C). I also trimmed a spot in the cork to place a 145 degree(f) safety fuse. Under that I placed a 2.2mm stiff aluminum plate. 6061,6160?? For my ssr I use a 50 amp knockoff from Banggood, so far so good. Heats very fast, almost as fast as my hot end! Highly recommended. My experience with 2 different printers usiing PEI print surfaces and one with a Keenovo heater is that you've got about 2 years of reliable adhesion with the 200MP adhesive that Keenovo uses and the 468MP adhesive transfer sheets also use, if you're heating to ABS print temperature, and printing a lot (almost daily). SoM has had the PEI restuck to the plate twice and it is starting to lift at the edges again. The PEI on UMMD (see image below) suddenly let go 2 days ago. The heater on UMMD is starting to let go of the plate (see below) so I have temporarily propped it up with a piece of silicone foam. This is why it's better to attach TCOs to the heater than to the plate. If the heater comes off the plate and falls away (in printers with the bed moving in Z or Y) and the TCO is mounted on the plate, it can't do its job. Be sure to clean the plate thoroughly before sticking the heater/PEI using the 468MP adhesive transfer tape. When the adhesive lets go of the PEI, it remains on the aluminum plate, but has lost all stickiness. I didn't check the heater to see where the adhesive is. Edited 1 time(s). Last edit at 11/21/2018 09:26AM by the_digital_dentist. I will have a look at Micheals for some of that cork, I may go that route with a bit of a sandwich for extra assurance. I notice that both my heater and PEI sheet have 200MP adhesive with the 468MP transfer sheet. (Just curious as to what the spec on the transfer sheet is and why its worth mentioning.) My PEI is thinner then I would have preferred, but it was the right size and I was already making an order so I bought 2. For the record, I can't recommend that supplier I linked earlier for MIC6 plate. For the price of it, you would expect a pristine piece of metal, however mine has a couple of good dings in the one side that I am a bit annoyed with. For the purpose, I will be OK, but what if the consumer needed both sides to be good? I get it, I'm a small customer, but the website said I was welcome. Right away the OCD kicks in about having to remove the high spots from the gouges and is the gouge going to cause a hot spot on the heater?, probably not, but not a nice unboxing experience if you know what I mean. I paid almost $150 Canadian to get a premium product quickly, instead it took a week to finally cut ship a damaged one so I guess the FedEx was no use other then to avoid the postal strike. I guess they made the call to give me a piece of scrap rather then the new product I paid for. It was scrap because it is gouged and has other dimensions written on it. I would have been fine with a "cut off", but they sold me something that should have been discarded or sold as one good side only. This isn't regular aluminum stock, this is cast tooling plate. I wouldn't expect cheap aluminum extrusion to have damage like that, which is why it's annoying that this piece is damaged. Moving on, I have the day off today so I might do some puttering around. Coffee is made, meltzone podcast is on in the background. Edited 1 time(s). Last edit at 11/21/2018 08:57AM by Number_5. For the record, I can't recommend that supplier I linked earlier for MIC6 plate. For the price of it, you would expect a pristine piece of metal, however mine has a couple of good dings in the one side that I am a bit annoyed . Edited 1 time(s). Last edit at 11/21/2018 09:35PM by Holy1. So I'm about 80% the SSR from spool3d.ca is a fake, despite the banner on the website saying they sourced real ones. I'm back to placing an order for the original Crydom SSR I was after, it appears to be in stock, hopefully no issues this time, though I haven't received a receipt yet so maybe it screwed up again lol. -It says "made in Taiwan" instead of "Taiwan made"
-The castings are too rough. It's unfortunate because I can't trust anything they sell now, whether or not they intentionally sold me a fake. While my parts list was not written in stone, I just emptied my cart of $800-$1200 worth of parts. HiWin rails and DLP printer. Not big deal, my regular store has everything except rails. I don't need another printer lol, you know how it is keep adding to the cart to get free shipping, got carried away lol . The vendor thinks they may have send a counterfeit by accident. The picture that they took and have on their site is a apparently the real one. I sent them off a picture of this one which is different, see where it goes. Unfortunately in the meantime I got confirmation of my order for the Crydom 2425. Round and round we go lol. I will most likely use the Crydom on this build and if they send a real Fotek I will keep it for a spare or use it on another printer I guess. At least I wont have to second guess that part for the time being with the Crydom on the way. Incidentally I accidentally bought a DLP printer somewhere else lol. (Direct from manufacturer, saved over $300) The only thing they have left that I want is maybe some HiWin and some vitamins, honestly I don't think I am even going to bother using any linear guides. The Crydom SSR arrived in the mail today. The replacement for the counterfeit Fotek is in the mail. I found an old CPU heat-sink, I may re-purpose it for this SSR just because. Duet recommends a heat-sink if the SSR is used at or over 25% of it's current rating. My Keenovo heat bed will be drawing ~6.25A which is 25% of the Crydom's 25A rating. It never hurts to cool electronics so i will go with the heat-sink. Maybe it's an idea to use a thin layer of black silicone glue to attach the pei and maybe even the heater? It would require some practice to apply it properly and might not be as aesthetically but i don't think it wil let go after 2 years. I did not take the time to apply the 468mp properly to the PEI and failed to cover the whole sheet, so i used silicone glue in the corners. I don't think it would look to bad if properly applied over all of the sheet. Thin layer covering the pei and then press it to the build plate, anything comming under the edges can be fairly easy removed once it dried. Edited 3 time(s). Last edit at 12/13/2018 04:47AM by Govahnator. The blue silicone has bonded very solidly to the silicone heater. If the TCO ever opens, I'll clip the wires to it, and mount a new one (assuming the heater is still usable). I used the same high temperature silicone to mount a heater on an aluminum plate in an upgraded Taz printer a few years ago. It's still attached, but the printer hasn't been used much, so I can't tell you much about the bond surviving a lot of thermal cycling. 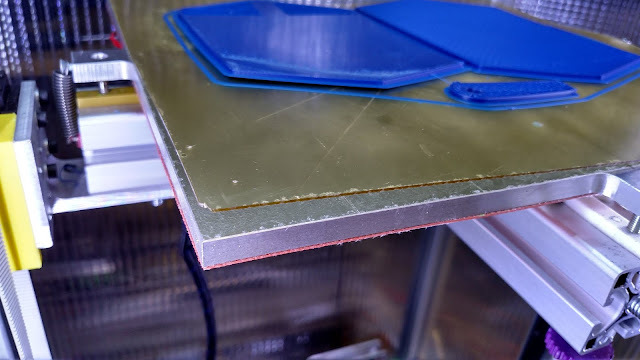 I don't know about using silicone to mount the PEI- silicone may not bond to the PEI, and since the PEI is somewhat flexible, it will conform to the adhesive under it which means you'll need some special technique to get the silicone to form a uniform coating. Maybe you could apply silicone, put the PEI in place, then run it through a roller to squeeze out most of the silicone.